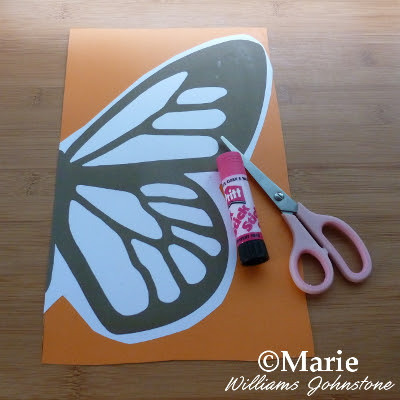 If you enjoy making some pretty butterfly themed crafts, having your own good template that you can use to trace around becomes pretty invaluable. 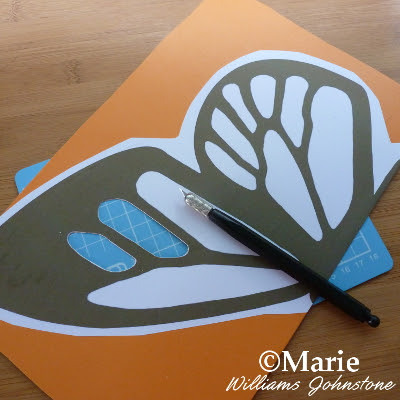 To make things much quicker and easier for you, I’ve got a free design butterfly silhouette template that you can print off and use. This is for quite a large design which should fill most of a letter or A4 sheet size when you print it out. I've created plenty of simple outline shapes based on these pretty winged insects before. But never a silhouette style of design with cut-away sections on the inside of the wings. You may even be lucky to print this a much larger scale depending on your access to a suitable printer. 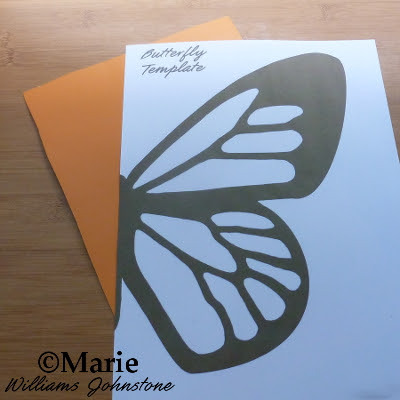 You can use this free butterfly silhouette template as a stencil to make motifs for all kinds of decorations including ones for Halloween. 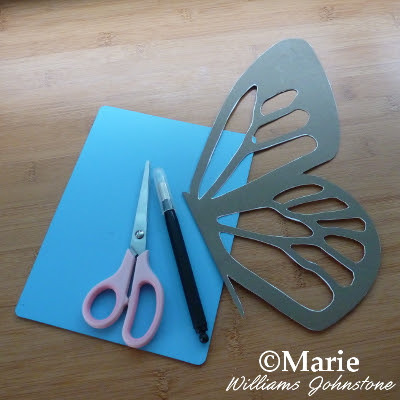 I've used this free design to make a small pair of fabric butterfly wings for a child to make a quick but pretty costume. You can draw around them and paint the design on to the front of a bag with fabric paints. They also make fun hanging decorations and large handmade shaped butterfly cards. 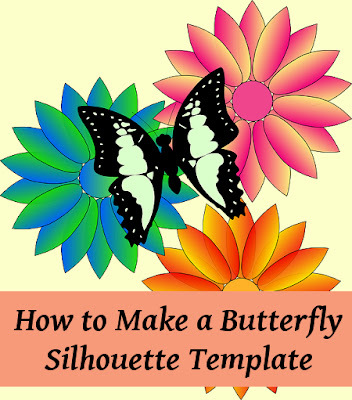 Print out the free template design (linked to above) for a butterfly black and white silhouette. Alternatively, you may have your own black and white design to print and use instead. This is half a butterfly (you don't need a whole one for a template since this is symmetrical) and it gives you the option of using the design from a side view where you normally see just one wing or a top down view of this insect where you'd see both wings. If you can print straight onto a thick card, skip to step 3. Otherwise print out onto plain white or a light color paper and move on to the next step. Use a stick glue or some adhesive that's not too wet to stick the printed design onto a piece of thick card. I used the back of a breakfast cereal packet which was an ideal thickness. I trimmed around the design first which meant there wasn't as much to glue. You want to cut out the inner white sections on the butterfly wings first. That’s because if you cut around the outside and then cut away the inside parts, the whole template then becomes more flimsy and harder to cut. It is possible to cut away the inner white sections with a pair of really sharp tipped scissors. You'd carefully use the tip on one scissor blade to make a hole in one of the sections and then gradually slide the bottom blade into the hole and cut around the piece that needs to be removed. I find these easier to cut with a craft knife and a cutting mat. Place the card over the mat and carefully cut away each white part with the craft knife. It is easier to cut out the smallest white sections first and then move onto the larger parts last. That's because cutting away the large parts first will make the design more flimsy and harder to cut. When you have finished cutting out the inner white sections of the design, you just need to cut around the outside of the black sections with a pair of scissors. Here is the whole template once I've cut it out. 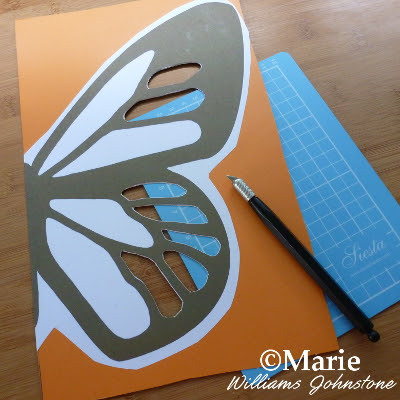 To draw out or trace a whole symmetrical butterfly, you need to draw around the template on one side then flip the template over horizontally, line up the middle section and trace around the other side. You can use this template as a stencil to make motifs for all kinds of decorations. I've used this one to make a small pair of fabric wings for a child, drawn around and painted on the front of a bag with fabric paints, for hanging decorations and large handmade cards. What will you be making with this free template? Let me know in the comments below. Image Credits: The introductory image is from Pixabay which is a free public domain image. 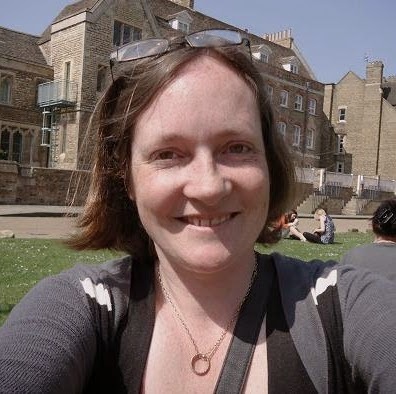 All other images belong to the author of this article, Marie Williams Johnstone.